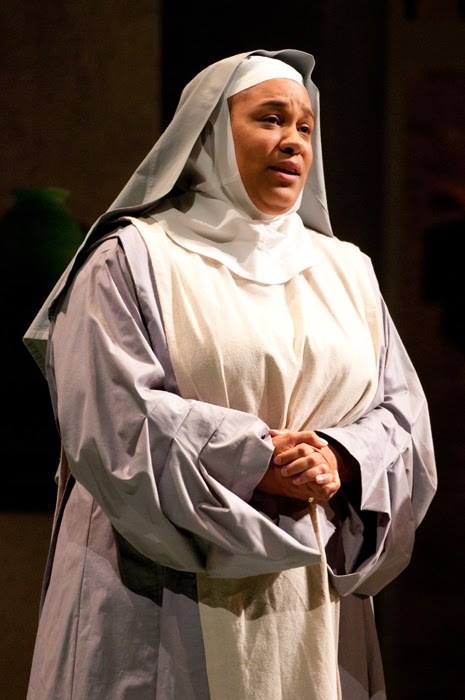 The opera-lovers of Seattle remember the strong impression Deborah Nansteel made as a Young Artist here in 2012/13, and from small mainstage roles such as the Nursing Sister in Suor Angelica and the Foreign Woman in The Consul. But the Washington, D.C.-based mezzo is about to embark on a much bigger sing: the dual role of Ino and Juno, both rivals to the title character, in Semele. When we spoke the other day Nansteel told me about the great new journey Semele represents in her career—and about an extremely exciting world premiere she just did at Washington National Opera. 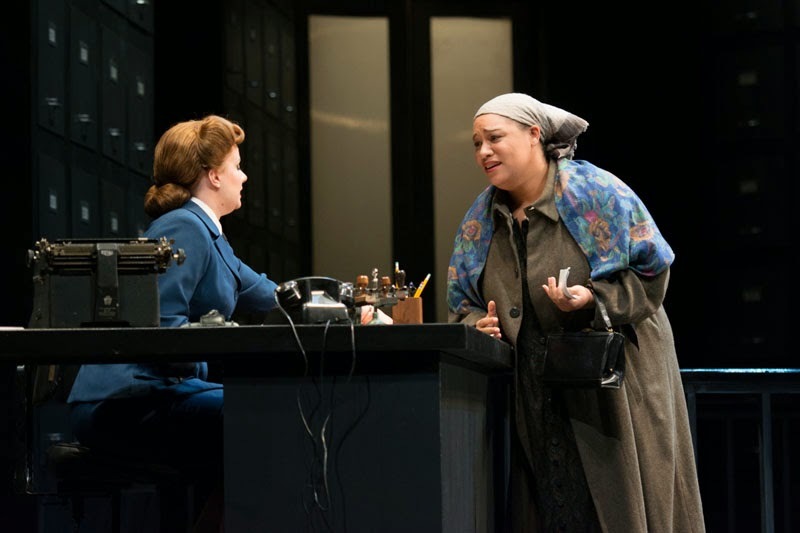 First off, tell us about the role you played in this recent world premiere of Penny by Douglas Pew and Dara Weinberg. Yes, Penny is about a 28 year-old autistic woman finding herself in life, finding her confidence and her voice. At the beginning of the opera she is traumatized—her uncle has just died and she was the one who found his body. She doesn’t speak, and she’s scared of going outside. So she goes to live with her estranged sister, who becomes her legal guardian. Penny’s uncle has left her a big trust to live off, but Penny’s brother-in-law wants to use her inheritance for a surgery he needs to go back to work. So the family situation is complicated! And my character, Penny, can’t speak. Odd, for an opera character! Instead she sings these dream-duets with her dead uncle, who is trying to help her find strength. Penny also has a social worker, who wants Penny to move out of her sister’s house and into assisted living. And there’s a neighbor, Martin, who is also a pianist, and he gets Penny to start talking again through music, through singing—he makes up a song and she repeats it. They have a strong connection. So the opera ends with this Penny opening the blinds and letting the sun come in, as she sings this empowering aria. We debated whether or not to show her walking out the door at the end, and untimately realized the audience may need the resolution after so much conflict in the show. This opera was premiered in Washington, D.C. at the National Opera? Yes, Alan Paul was the director, he is currently the Associate Artistic Director at the Shakespeare Theatre Company in D.C.. He’s one of the best directors with whom I’ve ever worked. And it was written for you! What’s that like, to have a composer get inside your voice like that? I loved it, I’d never had something written for me! Douglas Pew and I went to Cincinnati Conservatory of Music at the same time, so we already had a great working relationship. He’s a wonderful collaborator—for instance, I could say: “What if the musical line were to go down here instead of up, because what has come before is pushing my voice this way?” And he’d take that to heart. We were still making changes up until the final dress rehearsal, which made it such an exciting process. What research did you do to portray a character with autism? We met with a high-functioning person on the autism spectrum, as well as a care-worker and some family members of people with autism. But no two autistic people are the same, in terms of body language or functionality. My character, Penny, was high-functioning but at the beginning she was so traumatized she couldn’t speak. But she did make noise! Alan, the director, and I spent lots of time figuring out the right kind of movement for the character. Now in Semele you play both a downtrodden, rejected mortal woman and an all-powerful goddess. How do you switch gears from scene to scene? Power is one of the big gears that you shift here. Juno has a lot of power. She’s not self-conscious; she’s always in control. Whereas Ino is more helpless. She’s passive-aggressive, whereas Juno is aggressive-aggressive. Juno sets out to make her husband feel the same pain that she’s felt. That’s interesting, both your characters share this emotional state of pain: rejected, jilted. Yes, but Ino lets it take over her life: “There’s nothing I can do about it.” Until she takes action and tells Athamas how she actually feels. In a way they are both strong women who take action, they just go about it in different ways. Also, they both get what they want in the end. How do you play a superhuman divinity like Juno? As an actor, how do you make that character alive? I think about—not necessarily a goddess, but someone who is grounded, in control, powerful. Whatever she does, whatever decision she makes, is going to affect other people and she knows it. She knows what she wants she’s going to go get it. I certainly don’t think about this...ethereal being. Will Juno ever give up and just let Jupiter go do his thing? No. [laughs] He’ll never stop. But she’ll never stop, either! I think so. Without love you wouldn’t have the pain. If she didn’t love him, what would be the point of going to all this trouble to make him suffer? If she didn’t care about him, why bother? I don’t think she’d want revenge if she really didn’t care for him. We last heard you in Seattle singing lots of Verdi. Have you sung much Handel? How is singing Handel different from what you normally do? Everything is different. I’m not used to singing coloratura—this is the first coloratura role I’ve ever done. That’s right, you sing some fierce coloratura in this opera. I didn’t even know how to move my voice until a couple of years ago. When I was an undergrad I experimented with “Una voce poco fa,” some things like that, my technique was very different then, and I had no idea how to sing it then, either! Figuring out how to do coloratura with good technique came late to me. These are also bigger roles than you’ve sung here before. Yes, I’m used to doing maids, or the Nursing Sister or the Foreign Woman. What’s your favorite moment in Semele? At first I wasn’t so fond of “Turn, hopeless lover.” But now that we’ve staged it and I’m there with Athamas, interacting, that might be my favorite. It’s such raw emotion, it connects so viscerally. I didn’t think that would happen. But I love it, I just love it. What does it mean to be justified? Essentially, it’s a legal term that means to examine something and pronounce it free of any guilt. Picture this. A man is accused of a serious crime against another person.